Over the decades of my life, I have seen ammo (as well as guns, gun parts and magazines) go through phases of abundance ($5 box of 9mm, $7 Magpul magazines) to short supply (13 round Glock 23 mags for $89, AR-15’s tripling in price and .223 55FMJ for $1 per round and 9mm could not be found).During the most recent ammo drought of 2013, I remember all the standard calibers were not available, 380, 9mm, 40, 45, 357 in pistol with a few scatter boxes of 45 GAP around. The 327 Federal Magnum round was mentioned since, in a revolver. it can shoot the 32 Auto, 32 short, 32 Long and 32 H&R Magnum. 1. How much could he afford to buy at what cost per round. 2. 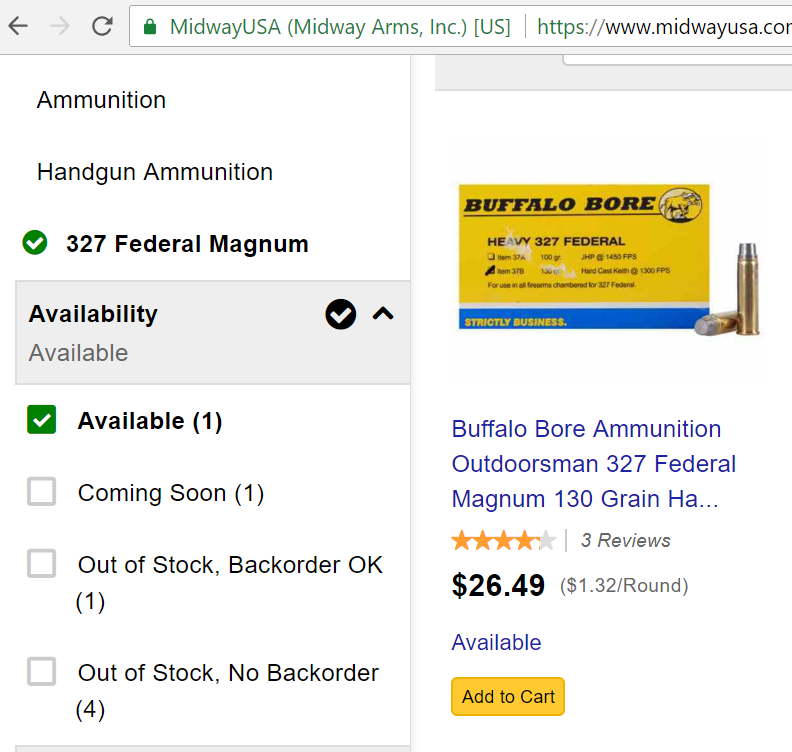 Ammunition availability in a crisis, ammo makers will be making what sells the most for the most, not an uncommon round. 3. In a worst case scenario, how would he find “pickup” ammunition. What is the chance that someone else had one of those caliber handguns. 4. The effectiveness of the rounds. In this case I would trust the 327 as a defensive round, and use the others if I had to, however I would prefer something more potent. The choice of handgun, caliber et al is complex. Fortunately in the Free States of America, we have a lot of choices, only limited by your finances. If you want one pistol that can shoot a large variety of calibers you should factor a few things in. 2. Is this your first and going to be only / main pistol due to above or other factors? 3. What exactly do you want / need it for? Below are several calibers that can shoot others in the same pistol configuration. These could apply to pistol caliber carbines such as lever rifles. The primary cartridge is listed first, don’t sway the other direction. 22 long rifle can shoot 22 BB, 22 CB, 22 Short and 22 long. 327 Federal Magnum can shoot the 32 Auto, 32 short, 32 Long and 32 H&R Magnum. 454 Casull can shoot the 45 Schofield (also called the .45 S&W) and .45 Colt (also called .45 Long Colt). 460 S&W will chamber the .454 Casull, the .45 Colt, and the short .45 Schofield (.45 S&W). I have no doubt there are others I am not thinking of right now. With all the above information, you have to ask yourself. 1. What handgun can I control? While the 460 S&W seems great, can I make follow-up shots as needed? 2. Are the choices common enough I can get more ammo when I want or need them? 3. Is it potent enough that I will bet my life on it for its intended use? A .22 for rabbit, squirrel or armadillo is different than a .22 for stopping a kidnapper from taking your daughter at the bus stop, 80 yards away. 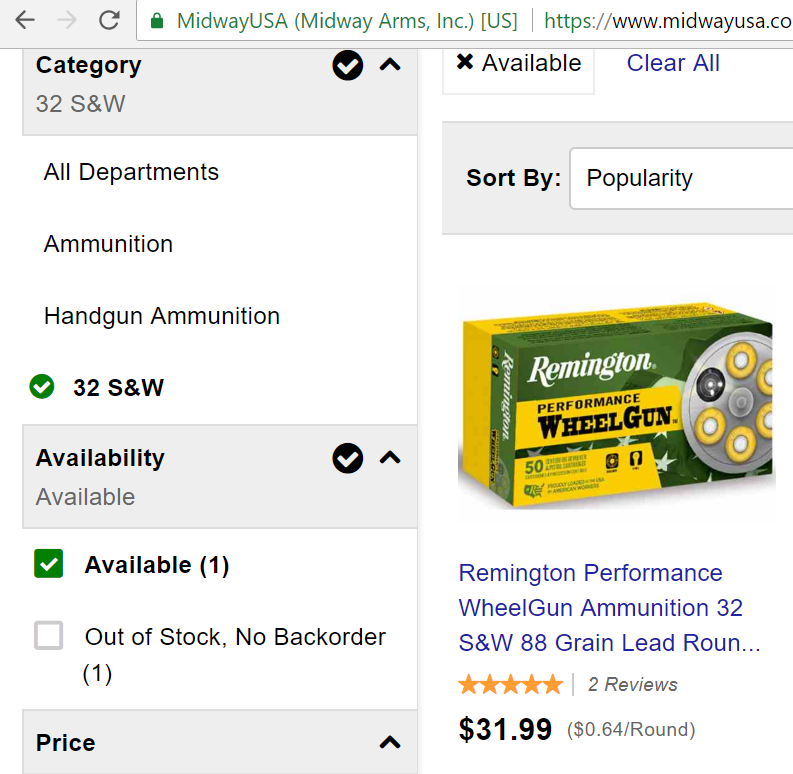 There are not a lot of in stock choices for the 32 caliber. 1. What is my MET-T (Mission, Enemy, Troops, Terrain ) for that weapon? 2. What ammunition selection was around during the last scare or two? 3. What are you willing to buy / stock up on now? 4. What is the cost per round compared to its capability? 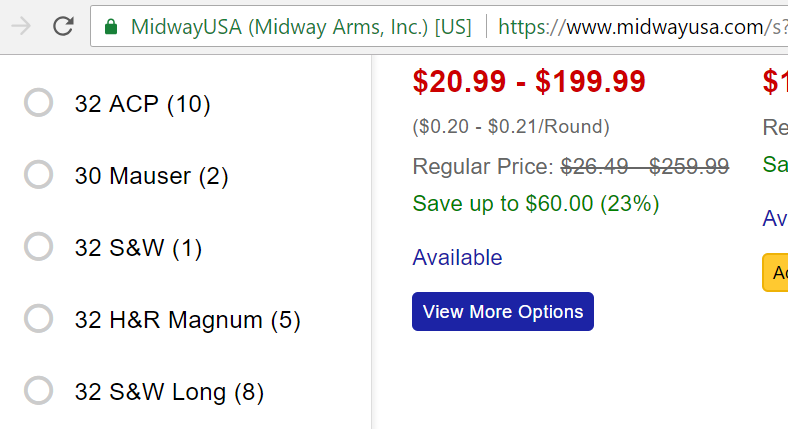 At Midway USA there is only one 32 S&W round in stock and it isn’t cheap. The 327 Federal also only has one round in stock and still would not be considered inexpensive at a time when things are plentiful. As an aside, regarding rifles, for all essential purposes the 308 and 7.62×51 are the same round along with 5.56 and .223. The 17 HMR can shoot the 17HM2, though cycling a semi-auto may not work so well. I hope to get an article out on ammunition selection for one rifle, soon. I plan on finishing an article on having one pistol and swapping barrels to allow caliber versatility that I started before this topic ever came up.